More than 40 groups decorated vehicles and gave out candy to hundreds of kids at this year’s event. 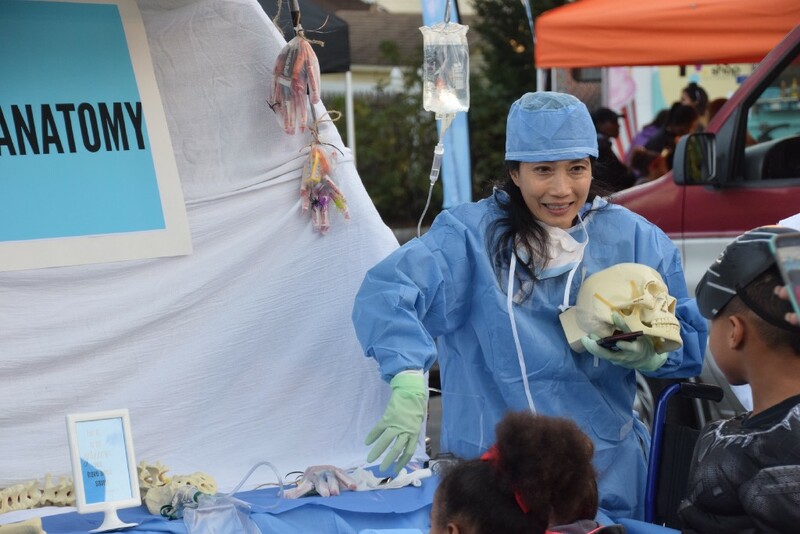 uth Aday greets trick-or-treaters at the God’s Grace Anatomy stop at Kingsway Church’s Trunk or Treat. Kingsway Church’s annual Trunk or Treat event last Tuesday was proof Halloween doesn’t have to only be about monsters, spiders and other spooky things. Kingsway Church, located at the corner of Chapel Avenue and Cooper Landing Road, annually holds a Trunk or Treat in the church parking lot on Halloween night. Church members, local residents and organizations deck out vehicles in a particular theme and hand out candy to kids of all ages. More than 40 vehicles were decked out for this year’s event. 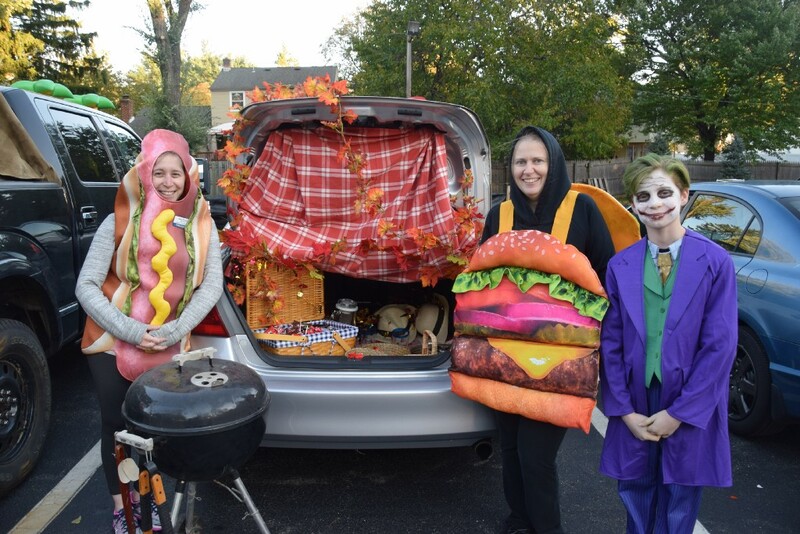 While there was certainly a few spooky looking cars, many families and groups decorated their vehicles to represent their favorite movies, TV shows, hobbies and other themes. The McCall family of Maple Shade decided to hand out candy at the Trunk or Treat for the first time this year. The family decided to theme their car after the Disney film, “101 Dalmations,” with the McCall children dressing as the puppies in the film and mother Yvonne McCall dressing as the film’s villain, Cruella de Vil. “We haven’t seen it done here yet,” Yvonne said in describing her family’s theme. Lee and James Rivera decided to let their daughter, Midnight, have some input in choosing their theme this year. The family decided to go with a “Ghostbusters” theme, as the new version of the film was a favorite of Midnight’s when it was released. 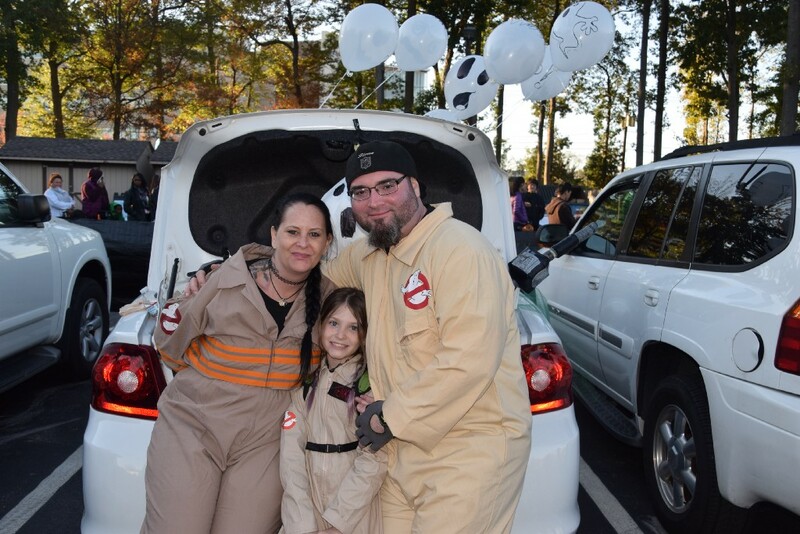 Lee, Midnight and James Rivera dressed up at Ghostbusters at Kingsway Church’s Trunk or Treat event last Tuesday. The Rivera family went all out with their theme, attaching decorative ghosts to their car and equipping the roof with green lighting. “The Sandlot” was another film featured last Tuesday. John Best and four of his friends dressed up as characters in the film. “Everyone likes baseball,” Best said about his group’s theme. One group of Kingsway Church members played off the name of a former television show for their theme. The God’s Grace Anatomy trunk featured six church members dressed as either doctors or nurses. Their parking spot included decorative bones and a surgical table where trick-or-treaters could reach under the table and grab their candy. Ruth Aday said the idea for the theme actually came after an activity the group did during a recent mission trip to El Salvador. Not everyone themed their trunks after a movie or a television show. A number of families and organizations came up with their own creative themes. 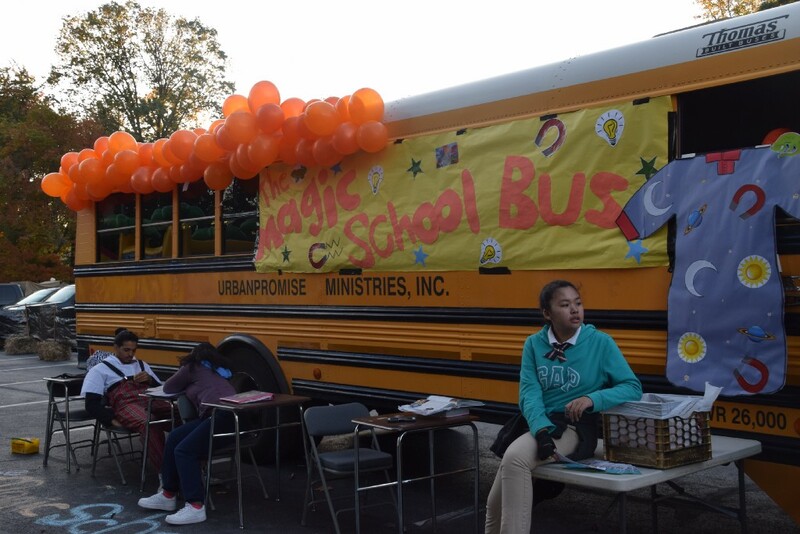 A group from UrbanPromise Ministries in Pennsauken transformed an ordinary school bus into the Magic School Bus for last Tuesday’s event. The Cepeda family transformed the back of their minivan into a jungle, with kids Chase and Uriah wearing gorilla costumes. Other creative themes include a campsite, Noah’s Ark and a pair of Christmas-themed vehicles. Rachel Grover and Dina Schrader decided to go with a simple theme for their trunk. They wanted to dress as foods, but were undecided on what they wanted to be. Sharla Dansby and Juanita George also went with a creative themed named enchanted forest. The trunk of their vehicle was decorated with a myriad of decorative flowers, leaves and lights. Like many who participated, Dansby and George felt the Trunk or Treat was more than just getting dressed up in costumes. They enjoyed handing out candy and making new friends. It was the first time the two friends had decorated a trunk for the event. “It’s great to give back to the community,” George said. 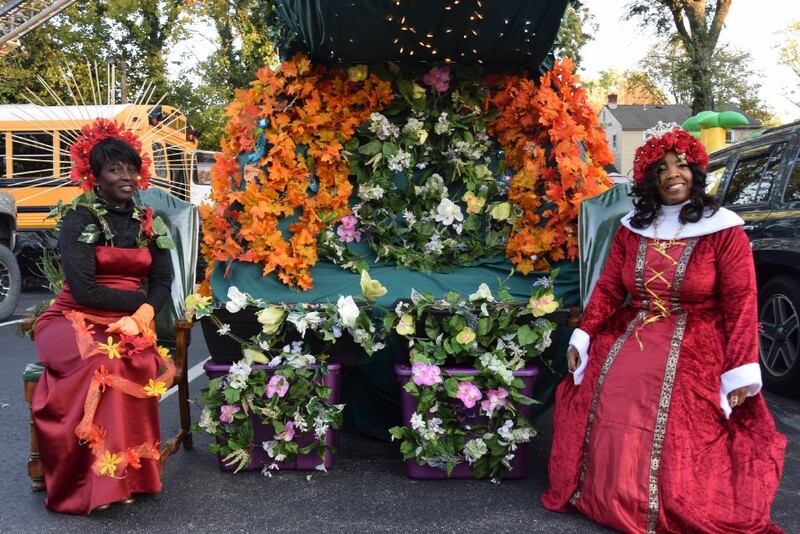 Sharla Dansby and Juanita George decorated their vehicle in an enchanted forest theme.